With just eight days to go to polling day in the general election, it is becoming increasingly clear that those in the Independent/Others category – which includes the Social Democrats, Renua and Anti-Austerity Alliance-People Before Profit – have been doing well over the last weeks and months. As a group they stand at 24 per cent. What’s also clear is that support for Fine Gael is past its peak. The party comes in at about 28.5 per cent. 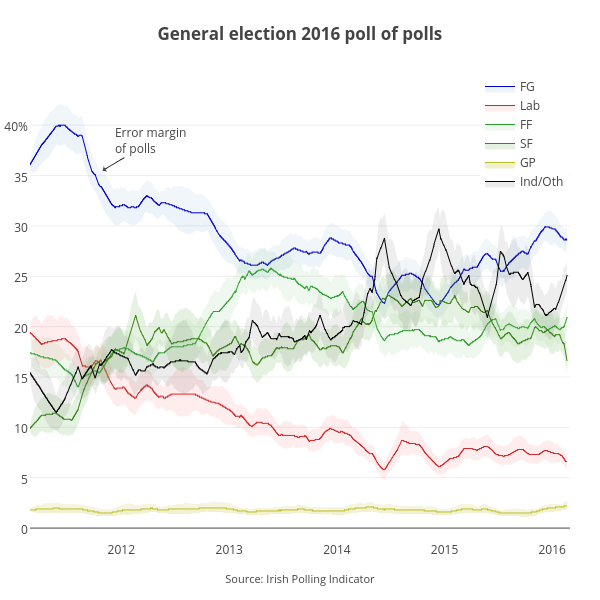 If we take into account the poll’s margins of error, we cannot be entirely sure Fine Gael support has dropped in the last few weeks. If more polls confirm the low estimate of 26 per cent in the most recent Red C poll, which is included in this poll of polls update, we would be able to draw that conclusion. In the poll of polls Sinn Féin stands at 19 per cent, with Labour on 7.5 per cent and Fianna Fáil 19 per cent. Sinn Féin did well in the previous Red C poll (20 per cent), but is now back to 17 per cent again. It is entirely plausible that this was just random error in the data and that Sinn Féin support has remained essentially stable over the last week. As I indicated before: those kinds of movements in a single poll need to be confirmed by other polls before we can draw solid conclusions. You need to take margin of error into account. Tom Louwerse is Assistant Professor of Political Science at Leiden University, the Netherlands. He started the Irish Polling Indicator when he held the same position at Trinity College Dublin, between 2013 and 2015. 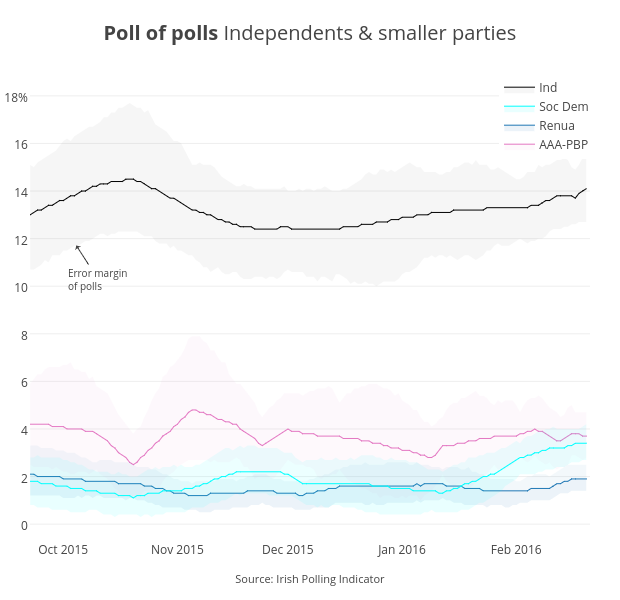 The Irish Polling Indicator combines all Irish opinion polls for the Dáil into one estimate of public support for the parties. Read more about the poll of polls and methodology.